What is Promensil used for? Promensil Menopause Original: contains 40 mg red clover isoflavones per tablet, specifically developed to provide support and well-being for women during and after menopause. Promensil Original relieves uncomfortable menopausal symptoms and, in addition, helps maintain healthy bones and a healthy cardiovascular system. Promensil Menopause Double Strength: contains 80 mg red clover isoflavones per tablet, specifically developed for women who require additional support during the early stages of menopause. All forms of Promensil are available without a prescription. Most women experience menopause around the age of 50, though it can occur before then. With menopause, the ovaries gradually stop making oestrogen. This may cause symptoms such as hot flashes, night sweats, sleeping difficulties and mood swings. Promensil contains hormone-like chemicals called isoflavones which counter the drop in oestrogen levels, reducing or even eliminating the symptoms of menopause. Promensil tablets should be taken with food. They should not be chewed but swallowed whole with plenty of liquid. Women going through menopause should also maintain a healthy lifestyle. A healthy diet and physical activity can help to alleviate some of the symptoms associated with menopause. one to two tablets, once daily with food. Do not take more than the recommended dose. Read the package leaflet before use. Promensil and Promensil Double Strength contain natural ingredients and are generally well tolerated. If you do experience side effects, consult a doctor. You are allergic to red clover or any other ingredient in Promensil. 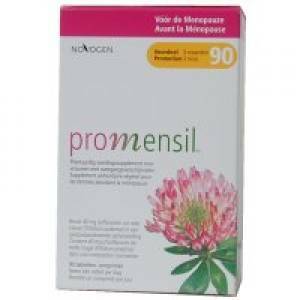 If you are taking medication or have a health condition, consult a doctor before using Promensil. Do not use this product if you are pregnant or breastfeeding. Promensil does not interact with alcohol or affect your ability to drive safely.